Quest's Spotlight on SQL Server Xpert Edition is designed to detect and diagnose performance issues across your Microsoft SQL Server environment by providing an overview of enterprise performance. With Spotlight on SQL Server, database administrators receive instant alerts to performance bottlenecks detected at the server level, after which the root cause is determined. The Xpert tuning module resolves SQL performance issues by ensuring optimal code quality and providing indexing options. The Spotlight on SQL Server Enterprise Reporting Pack offers 22 custom report options as well as 13 default reports that can be run over variable time ranges for different instances. The Waits Statistics page in the SQL Activity drilldown diagnoses performance problems that waits cause. It pinpoints when waits occur and what is being waited for. 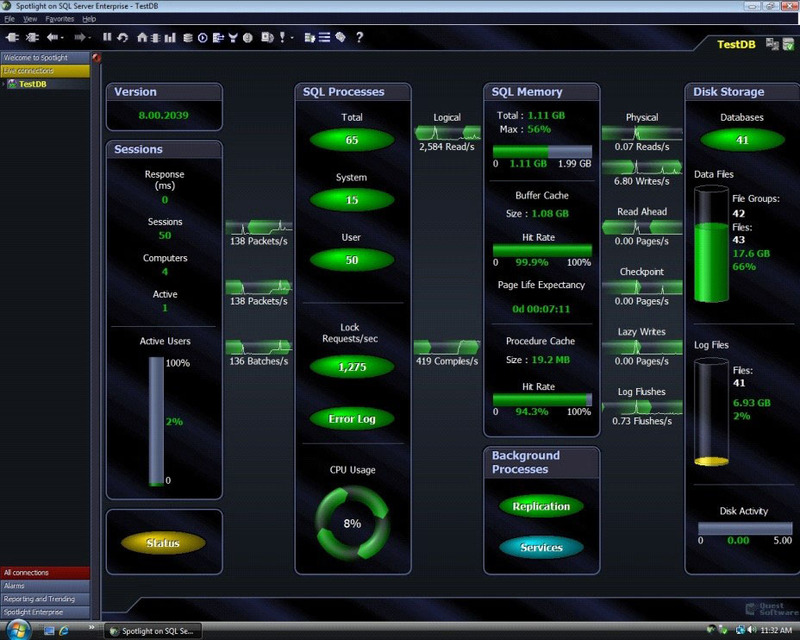 The Xpert tuning module provides automated SQL performance resolution, automated index generation and impact analysis of SQL-related changes made to the database. Using the trending portal, DBAs can access views and reports to assist with long-term trend analysis. By configuring the Diagnostic Server to store statistics in the Spotlight Statistics Repository, this data can be retrieved using views and reports. System requirements: Server versions – SQL Server 2000 SP3 or higher, SQL Server 2005, SQL Server 2008, MSDE (2000) and SQL Express (2005); operating systems – Windows 2000 SP4, Windows 2003, Windows XP SP1 or higher, Windows Vista, Windows 2008; client hardware – 500 MHz Pentium 3. Pricing: Please contact Quest Software for pricing information.